Interactions Explorer can be technically defined a “relational database “. It was built in collaboration with the University of Modena and Reggio Emilia (Italy). More simply, we can say that it is some sort of journal, encyclopedic in size, which is continuously updated with information useful to monitor drug interactions; it enables the “reader” to select with great immediacy the information of interest and assess them visually. All that is required is first to select the names of the active principles, either directly or through the trade names of the drugs, or, in the pharmacists devoted release, through the package numeric codes. Once this is done, you can access various options for analysis at different levels, from the simplest to the most sophisticated. All this within only a few minutes. The “GUIDE” pages will allow you to fully explore. Our goal was to create a tool that would allow to go beyond the usual software or databases, which merely present only interactions between pairs of active principles, with a clear trivialization of the problem. As described below, more than two active principles can create complex metabolic effects, and consider the interactions only as the result of pairs can lead to very serious errors, with dramatic consequences on the patient health. In order to clarify the technical content of this “encyclopedia” we invite you to consider the reasoning we followed to build Interactions Explorer. We asked ourselves: what would we do if we had 10 hours time to dedicate to each client, and wanted to grant him the therapy as safe as possible? Basically we would seek information about the drugs in use to do a summary later. • The information is scattered, even when you apparently find a dedicated paragraph. • The information appears lagging behind the studies: the drug label update can follow the research findings of many months or even years. 2) The studies of the scientific literature on associations typically involve the interaction between pairs of drugs. See how these studies are constructed. Usually there is a recruitment of a dozen healthy volunteers: after a wash-out period (other drugs or substances may “confuse” the metabolic picture) you administer the drug 1. When the drug 1 reaches a steady blood level after few days, you add the drug 2. You’ll therefore verify the pharmacokinetic parameters to see what has changed in the blood. To better illustrate, we refer to a study of Wong et al. 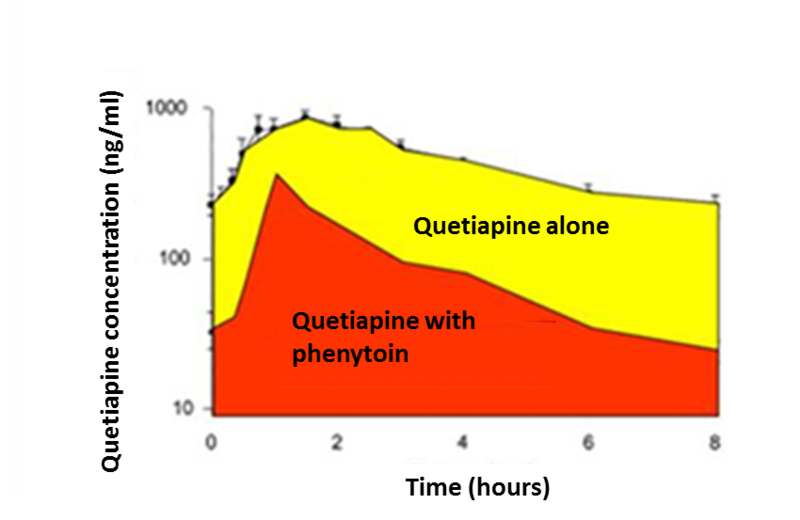 (2001) about quetiapine (an antipsychotic, drug 1) and phenytoin (an anticonvulsant, drug 2). 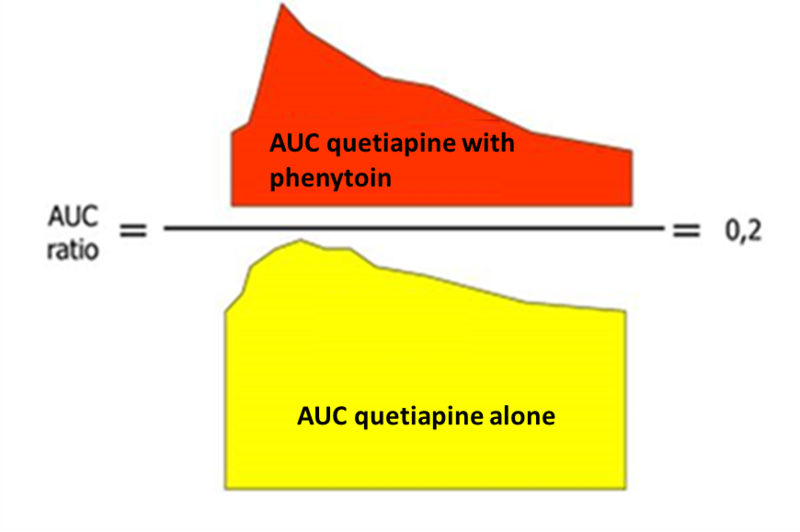 Among the pharmacokinetic parameters to be monitored (eg at day 9 and day 20), the AUC (Area Under the Concentration curve) is particularly important, as it is considered the “gold standard” for the presence of a drug in the organism. The AUC can be easily calculated: if we take blood samples after the drug administration we will have a distribution of blood concentrations similar to the one reported in Figure 3. The comparison between the areas of the two study drugs (AUC ratio) will give us an important finding: the magnitude of the change in blood concentration. 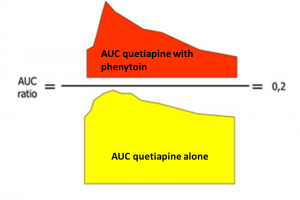 In the example an AUC ratio of 0.2 means that the blood concentration of quetiapine was reduced to one fifth of what would have been if it had been administered without phenytoin. Phenytoin reduced the presence of quetiapine because it accelerates its metabolism. The opposite case is of course also possible: Drug 2, added to another drug (1) may block its metabolism and increase its blood levels. 3) This leads us to the third source of information: the studies from the scientific literature illustrating the metabolic pathways of drugs, herbals, non traditional medicines, drugs of abuse, foods, etc..
We may say that a drug (or more generally an active principle) typically undergoes a transformation in the body (by enzymes) which is also regulated through the passages through the cellular membranes (by transport proteins). The transformation is aimed in general to inactivate the drug and to transform it from lipophilic (able to cross the cell membrane) to hydrophilic (able of being excreted). What we have just described refers to only one of the metabolic properties of a drug, which is the one to be a substrate: in this case the drug is only the object of the activity of enzymes and transport proteins. But the drugs may also have an active role through inhibition and induction of the activity of enzymes and transport proteins. It is useful to remember that the effects of these changes may be contextual (ie, an active principle may be substrate, inhibitor and inducer of the same enzyme / protein), additional (more active principles can add their inhibition or induction on an enzyme / protein) and differentiated in the timing (the inhibition is a matter of a few hours, the induction requires some days, since it involves the protein transcription). About the additional effect we mention the study of Englund et al. (2004): everyone knows that digoxin is a drug with a narrow therapeutic range (between 0.8 and 2.2 ng / ml in blood levels). 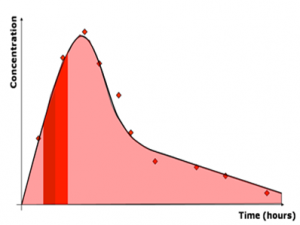 Exceeding the threshold leads to very serious symptoms of toxicity. Digoxin has in P-glycoprotein its principal route of elimination from the body. Therefore it is dangerous to associate digoxin with strong P-glycoprotein inhibitors which would reduce its blood clearance. 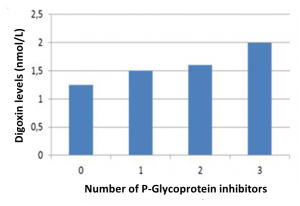 For this reason we will find a specific warning in the labels of strong P-glycoprotein inhibitors (for example, cyclosporin). 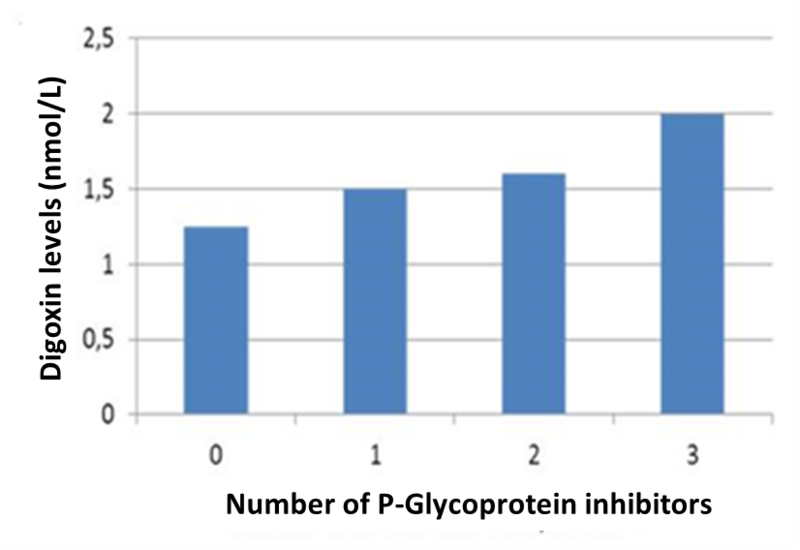 But as shown in Figure 7, the same effect of inhibition can be achieved by administering various mild inhibitors of P-glycoprotein, resulting in digitalis toxicity, without any warning in the drug labels. About the timing of interactions, in addition to the different behavior of inhibition and induction, it should be noted that sometimes the drugs last a long time in the blood after the patient has stopped taking them. The power of an active principle in competing, inhibit or induce is measurable and definable with constants or coefficients of multiplication. The affinity of a substrate for its modifying enzyme is measured by the Km (Micaelis Menden constant or S50): it gives you the idea of the turnover of processed molecules: obviously processing as a whole depends on the total amount of enzyme (eg the CYP3A4 is much more represented than others in the liver and in the whole body: therefore if the Km value is the same for another enzyme, the prevalent involvement of CYP3A4 will have a more important effect. It may happen that even with low Km – high affinity – an enzyme can be so scarce in the body to process anyway a small quantity of substrate. When two drugs are co-administered, the drug with higher affinity (low Km) will competitively inhibits the binding of the drug with lower affinity (high Km). The constants measuring enzyme inhibition, expressed in micromoles, are called IC50 (concentration that inhibits 50% of the enzymatic activity) and Ki (as IC50 but it also takes account of the affinity towards the enzyme); values less than 1 micromole are typically indicators of a strong inhibition. The induction capacity is quantified as a multiplication factor of the enzymatic activity, of the amount of enzyme proteins or of RNA molecules. (Emax). 4) Fourth and final source of information are the case reports, ie descriptions of clinical cases. The case reports don’t have a great scientific value, but they may suggest some reflections on what is observed. The bibliography includes over 5,600 clinical trials. Interactions Explorer data refers only to studies of human biology. 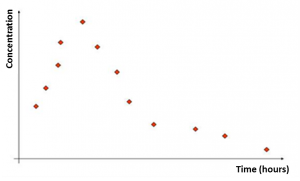 Approaching the interactions problem is necessary when we want to deal with a clinical assessment starting with solid basis. However, the extreme complexity especially of the pharmacokinetic interactions, will never allow for a risk-free prescription. A share of risk is unavoidable. Our effort is to provide as much information as possible, and this should therefore be understood in the light of reducing that risk. The information contained in the database is not and cannot be exhaustive of the literature because there are too many variables. These range from differences of keywords in different databases to different exclusion criteria of the trials, etc..
Often, also the drug labels are biased sources. Not all pharmacokinetic and pharmacodynamic interactions are reported. Having said that, the use of Interactions Explorer does not replace a thorough reading of the labels. Finally, the scientific literature and labels are written in a not standardized way.